The Chesapeake on a Stormy Day. Dan’s photo. Sea level is rising rapidly around the Chesapeake Bay. Faster actually, than nearly any other place on the East Coast of North America, and only a few spots along the Gulf Coast are recording a faster rate. The reason has been suspected for quite a while, but now a new study published in the journal of the Geological Society of America has confirmed the cause, and the news is not good. The paper is titled Pleistocene Sea Levels in The Chesapeake Bay Region and Their Implications for the Next Century. You can can read the entire paper here. The rapid sea-level rise is already seriously affecting the barrier islands like Assateague National Seashore. World-wide, the sea level is now rising at a rate of about 1.7 mm per year, but in the Chesapeake Bay region it’s double that, at 3.4 mm per year. The question has been whether this is just a short-term rate that will soon disappear, or will the faster rise continue. If it continues, then this will have a serious impact on cities like Washington, Baltimore, and the entire Delmarva Peninsula, with its popular beaches. The rise in sea level on Delmarva is a result of not just more water in the ocean, but also because the land itself is sinking. In areas like Louisiana and Florida, the sinking is the result of ground water withdrawals (and oil and gas exploration as well). Here on Delmarva though, the answer has to do with ice. USGS imaging is able to see the river channel of the Susquehanna River when it flowed through what is now Blackwater NWR during the last ice age. Sea level was much lower then, and there was no Chesapeake Bay. When the glaciers melted the sea rose and drowned the river valley, leaving the present day Chesapeake. 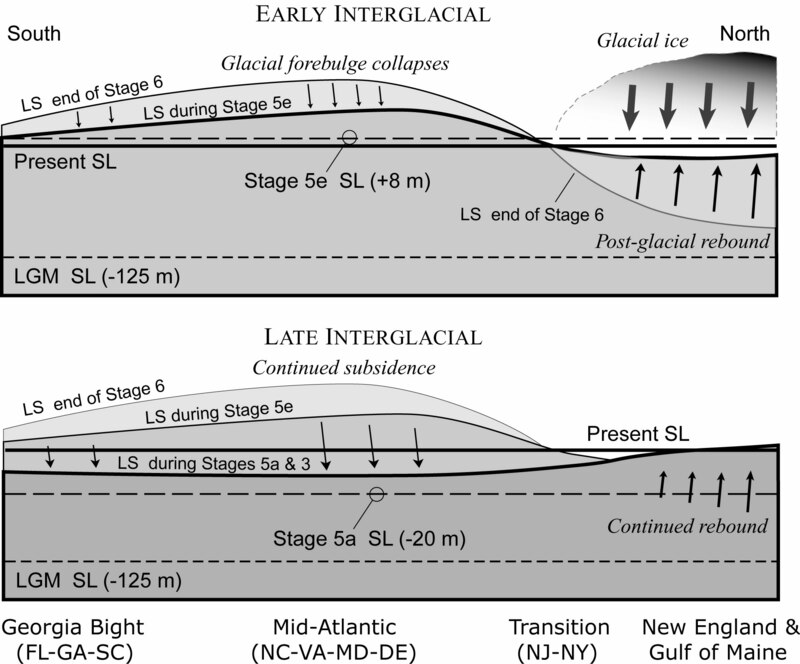 The last ice age ended about 12,000 years ago, and for a hundred thousand years before the glaciers melted there was a slab of ice over the northern U.S. that extended down to Pennsylvania. That ice pushed the ground downward into the mantle of soft/hot rock below. As the ground was depressed to the north, the area around the Chesapeake rose up in what called a forebulge. You can see this fairly easily when you push down on a soft mattress, and this forebulge has been slowly coming back down since the ice melted. USGS scientists looked at sediment cores takes from Blackwater National Wildlife Refuge and have determined the sea levels in the region back to the last warm period and have concluded that the land subsidence around the Chesapeake Bay is likely to continue for hundreds of years. The fast rising sea level means coastal towns will have to spend much more money on beach re-nourishment in coming years, or face losing summer tourism. Ongoing GIA-driven subsidence in the Chesapeake Bay region challenges a region already threatened by sea-level rise. At the Blackwater National Wildlife Refuge, we use rate consistency to predict ~0.16 m of subsidence for the region in the twenty-first century (using twentieth-century values from Boon and others  that presumably include the effects of groundwater withdrawal). The likely range of average global sea-level rise for the twenty-first century is 0.33–0.82 m, based on a non-aggressive climate mitigation policy (IPCC, 2013). Superimposing this sea level rise estimate over 0.16 m of subsidence yields a total predicted Rel. Sea Level rise of 0.49–0.98 m for the Blackwater National Wildlife Refuge by AD 2100. These are minimum estimates; several lines of evidence suggest that sea levels will rise more quickly in the Chesapeake Bay region. Recent tide gauge analyses indicate the acceleration of sea-level rise in the North Atlantic in recent decades, possibly due to dynamic ocean circulation processes (Yin et al., 2010; Boon, 2012; Ezer and Corlett, 2012; Sallenger et al., 2012). If this acceleration continues, it could induce an additional rise of 15 cm for the Chesapeake Bay and Washington D.C. areas by AD 2100 (Yin et Figure 5. I have seen this happening at an alarming rate the past 10 years. The inland salt intrusion is devastating the shoreline treeline and is “popping up” within the coastline forests, manifesting “dead pools”. Take a walk through Cape Henlopen’s trails to witness.